Taipei, June 27 (CNA) Many Taiwanese and foreigners showed up at Canada Day celebrations held in Taipei Saturday that featured Canadian culture and food specialties, including beavertails, a traditional pastry. This was the first year in which visitors to the Taipei celebrations had a chance to taste beavertails -- fried dough pastries made in the shape of a beaver's tail -- according to the Canadian Chamber of Commerce in Taiwan (CCCT), which organized the event. 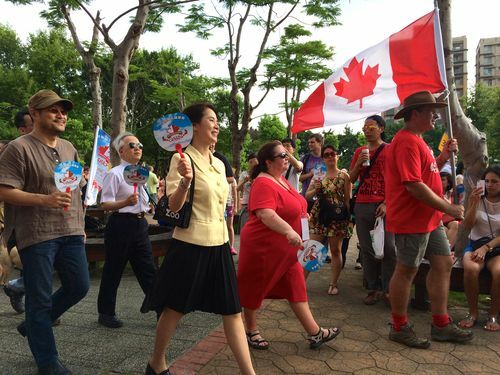 The celebrations were held at the Hakka Cultural Park in Taipei to mark Canada's 148th birthday, which falls on July 1. Visitors to the event also had an opportunity to sample Canadian beef, a Quebec specialty called poutine, various brands of Canadian beer, and Bloody Caesar cocktails, said the CCCT. Among those enjoying the day were CCCT Acting Chairman Leo Seewald, Canada's representative to Taiwan Kathleen Mackay and Taipei Deputy Mayor Chou Li-fang (周麗芳), who jointly cut a huge cake in the shape of the Canadian national flag after singing Canada's national anthem. As part of bilateral cultural exchanges, the Taipei city government provided traditional Hakka cakes to give away to the visitors. As in 2014, there was a mechanical bull-riding competition, with the winner getting a round-trip ticket to Canada, the CCCT said. Taiwanese and Canadian bands also staged live performances at the event, which was scheduled to end at 9 p.m. with a fireworks show, the CCCT said. Last year's celebrations attracted about 8,000 people and the number is expected to rise to 10,000 this year, according to the CCCT.